Current parking operators or facility owners and city administrators as well as urban planners are hamstrung by the lack of real-time information as well as historical trends.. ParkingRhino aims to solve this very problem and help businesses and cities alike to make data driven decisions when it comes to parking management. Parking Operators or Facility owners and City Planners can use ParkingRhino's Reporting & Analytics product to visualize parking trends and make data driven decisions. Our parking analytics helps parking managers and city planners optimize parking supply and demand. ParkingRhino's analytics product can help: Traffic planning for upcoming events, planning for enforcement routes, parking utilization and demand across different clusters/business areas in a city, help operators in yield management by using predictive analytics to make smarter pricing and inventory allocation decisions. ParkingRhino Operator Dashboard empowers every parking operator manage all of its parking information online. ParkingRhino Operator dashboard is provided to each parking operator to visualize all parking data information in one console. The Operator dashboard is a real-time centralized data management system to track occupancy, revenue, duration and reporting. City Dashboard provides a heat map of busy locations across different neighborhoods of a given city. Such data is powered by real-time parking information as well as influenced by real-world events such as weather, congestion etc. as well as historical occupancy patterns in those areas. 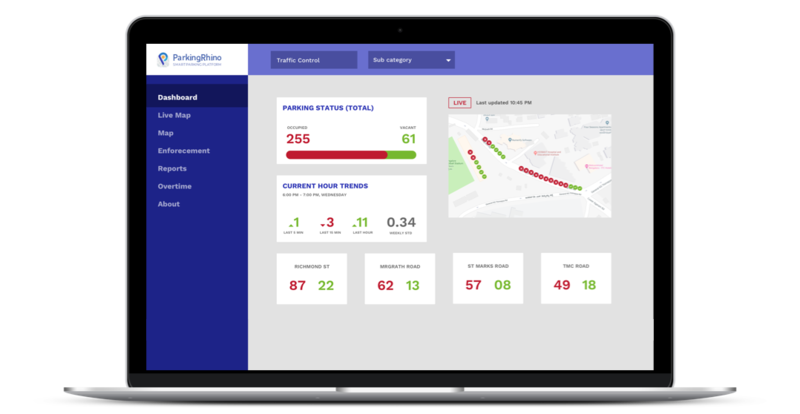 ParkingRhino's analytics product collects data from both on-street and off-street systems and analyses via our proprietary algorithm to generate occupancy information and send it to the driver's system. Drivers can use ParkingRhino citizen mobile app (available currently on Google Play store), 3rd party web or mobile apps integrating the ParkingRhino API and integrated inbuilt OEM car navigation system to access real time parking occupancy information.